Finally! 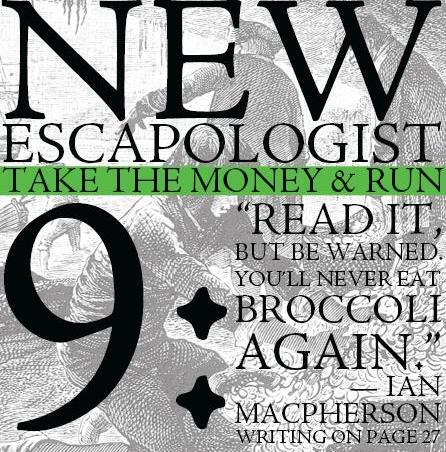 Issue 9 of New Escapologist is ready to go. The theme is money. The title is “Take the Money and Run”. This is what the cover looks like. Highlights of the issue include a short piece by Dice Man Luke Rhinehart; an interview with philosopher Joseph Heath; a short story by comedian Ian Macpherson; top-drawer humour from Robert Wringham; and articles by blog giants Jacob Lund Fisker and Mr. Money Mustache. It’s a massive 92 pages of nicely-typeset money-themed Escapological marvels. Buy it now! Available in print and PDF. Subscriber copies and pre-orders are already flying the nest. This is a fantastic issue! My wife and I have really enjoyed reading “Confessions of a Homeowner” because it really speaks to our current situation. We are trying to eject what Drew Gagne called a “massive time-guzzling albatross”. When my wife read the article she asked, “Did YOU write this article?”. That’s because just about everything he said in the article applies to us! It took me like five minutes to convince her that I was not the author. Thanks again for putting together such an awesome issue! Great! Thank you very much. I’ve forwarded your praise to Drew. Best of luck escaping the albatross!